Countless windmills, historic churches and fisherman’s cottages. The good ol’ fashioned Dutch villages near Amsterdam seem to have stood still in time. Some parts of them still look the same as they did 100 years ago and they’re of the few places where you can still see men and women dressed in traditional costume (though, more often they wear it on holidays). Zaanse Schans, Monnikendam, Broek in Waterland and Marken are picture perfect Dutch villages near Amsterdam and make for a perfect day trip. 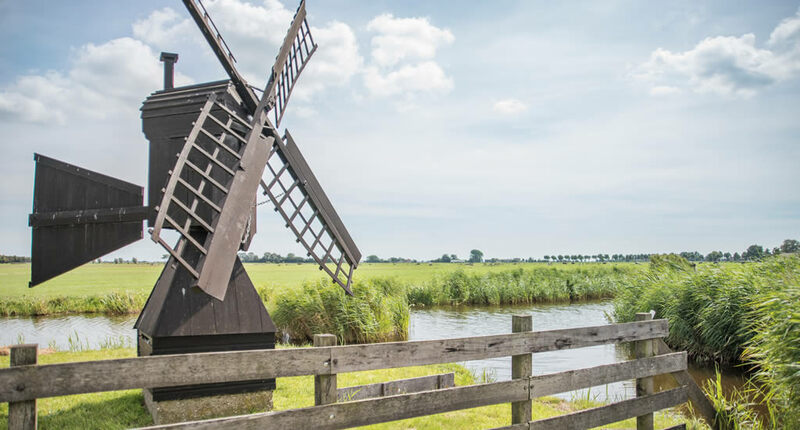 Can you believe that the impressive amount of old-fashioned windmills clutched together at Zaanse Schans were pretty much the first industrial site in the world? Hundreds of windmills along the Zaan river once produced linseed oil, paint, tobacco, mustard and paper. The dozen of windmills you can see and visit today are actually still working the traditional way and people are working there with care. Take your time to explore them at your own pace, it’s worth it, even though they seem like a tourist trap. 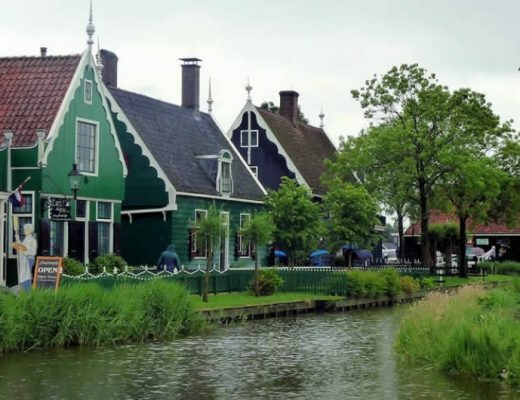 Other buildings in Zaanse Schans have been brought in from all over The Netherlands to create a Golden Age village. 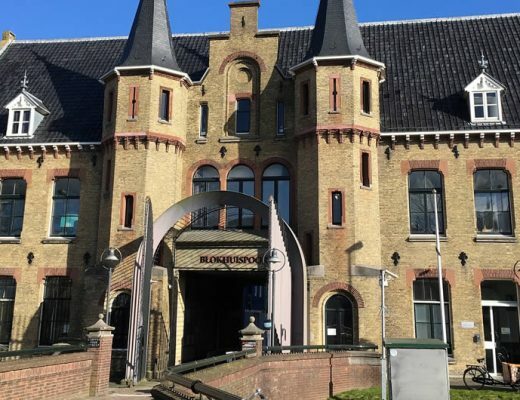 The clog museum in Zaanse Schans is actually rather interesting (yes, and this coming from a Dutchie who rolls her eyes at anything stereotypical). And it’s lovely to just take in all the old-fashioned architecture. Pressed for time? 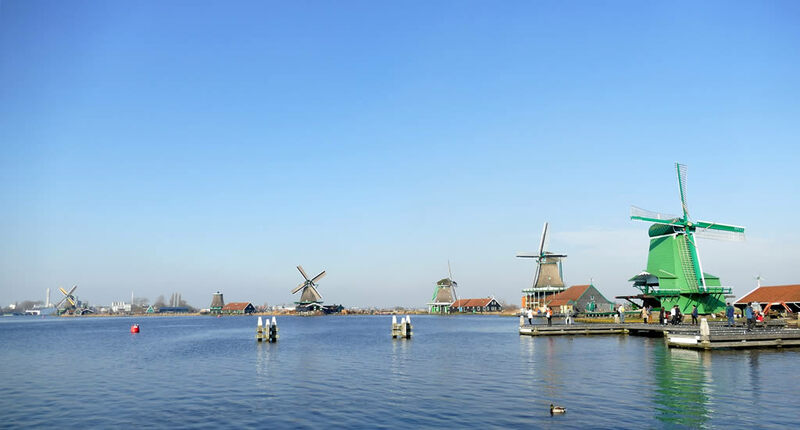 Take a Zaanse Schans sightseeing tour. If you don’t mind being 15 minutes outside Amsterdam city centre (which you can easily reach by train), stay at the Inntel Hotel Amsterdam Zaandam, which is like a fun play on the traditional Dutch houses in Zaanse Schans and which offers amazingly comfortable rooms, a spa and a good restaurant for a very reasonable price compared to Amsterdam hotels. A couple of years ago I had a work appointment in Monnickendam. I had never been there and thought ‘why can’t this client be based just somewhere normal, like in Utrecht, Amsterdam or The Hague, pff’. It was a Monday morning, rather early, when I caught the bus from Amsterdam central station. And when I got off in the small town centre of Monnickendam my jaw hit the floor. Basically, I ended up in what I imagined Holland fisherman’s towns would have looked like 200 years ago. With colourful, wooden cottages and small boats along the harbour, lace curtains in windows and nothing (but seriously nothing) going on. Remember, I am from The Netherlands, so I am often just as dumbstruck by something exceptionally Holland as most tourists. I highly recommend going to Monnickendam on a weekday morning, when it’s quiet and take in the relaxed atmosphere. You won’t be sorry. 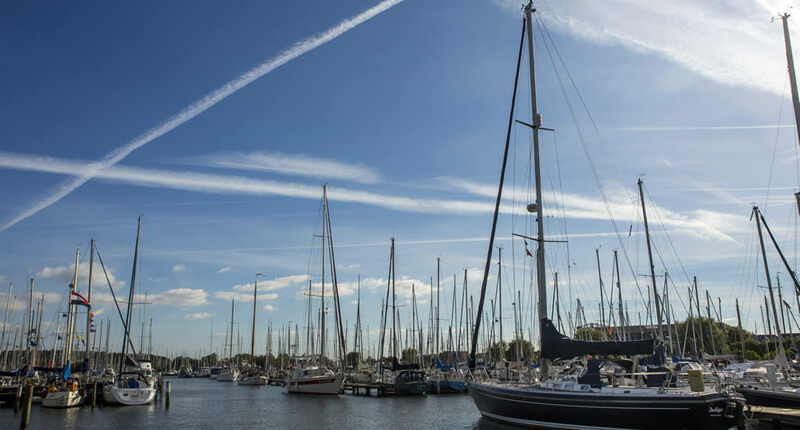 It’s only 15 minutes by bus from Amsterdam and Monnickendam can easily be explored in an hour or so, a nice little break if you don’t have much time. Whenever I see tourists and visitors writing about this, they call this place ‘Waterland’, but this is actually more like the region a little north of Amsterdam. 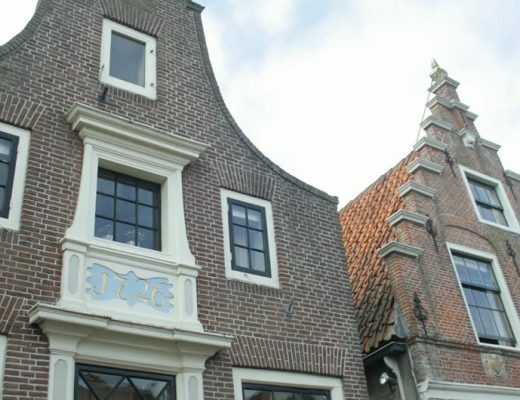 The central village you have to visit however is Broek in Waterland. 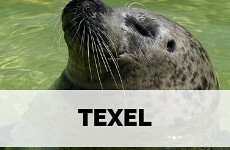 Only 9 kilometres north of Amsterdam and easy to get to by bus. You couldn’t feel further though from the bustle of the Amsterdam canals, Rijksmuseum and Dam Square. Broek in Waterland is the perfect getaway if you would like to have an hour or two of quiet away from the city. Time seems to have stood still in Broek in Waterland, where picturesque Dutch wooden houses stand amongst green en canals. All inhabitants seem to prefer travelling by boat as they all seem to own one. 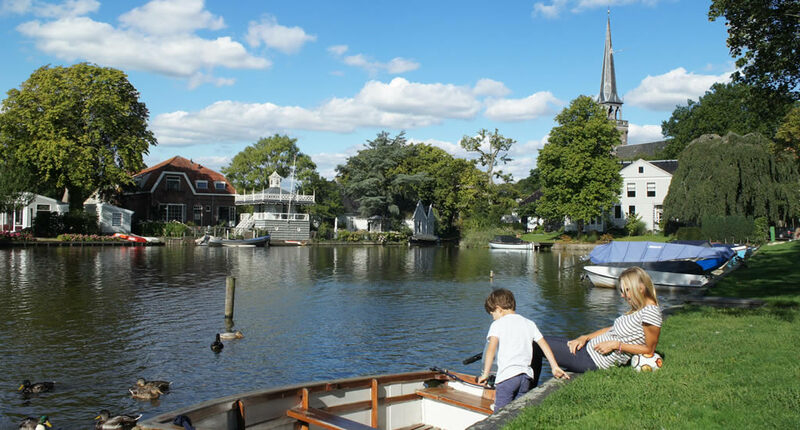 Take a little boat trip yourself when you visit Broek in Waterland to take it all in. 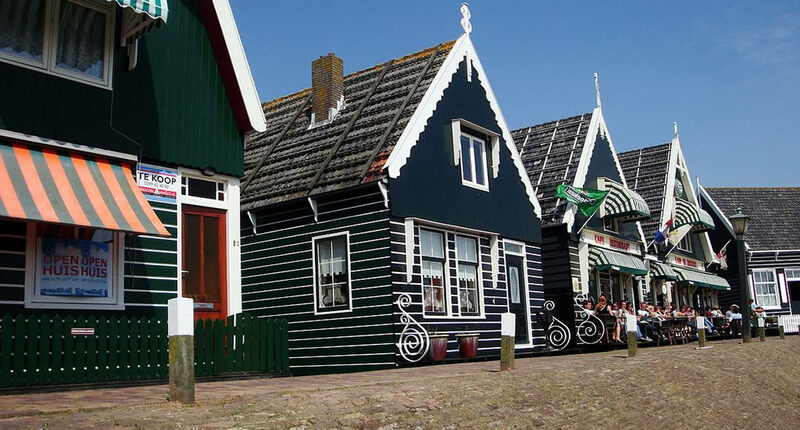 A visit to Marken is pretty special, even for Dutch people. The fisherman’s village used to be a rather isolated island until it was linked up to the mainland in 1957. The car-free town centre, with wooden houses and clogs standing outside, seems like a picture from a history book. Visit the clog-making workshop and the museum with traditional clothing. Take the bus! If you’ve got an OV Chip Card to get around Amsterdam, you can easily use this card to take the regional busses. 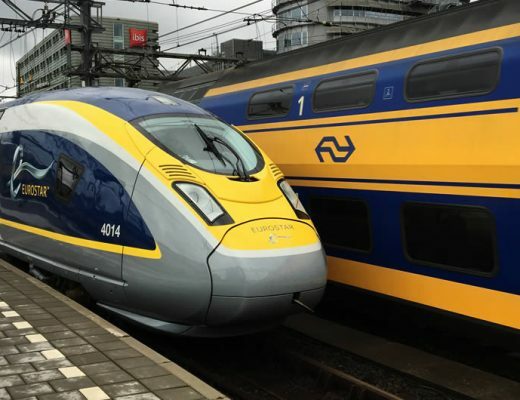 All regional buses leave from Amsterdam central station. Use this website to plan your trip. Get on the hop on, hop off bus. 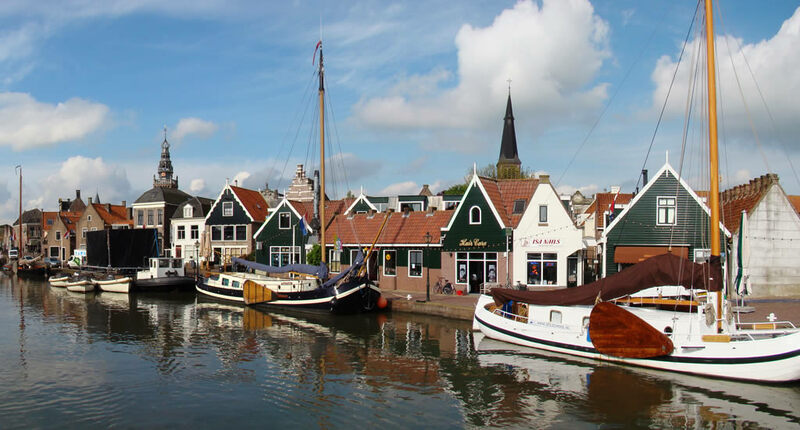 With one bus pass you can easily visit 7 typically Dutch villages near Amsterdam, like the ones I mention above, but also Edam, Volendam and Purmerend (though the latter isn’t that interesting). The bus pass is well worth the money, though. 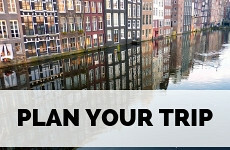 Or you could take a day trip from Amsterdam and take in Volendam, Edam and the windmills of Zaanse Schans all at once. Would you like to see more less-than-touristy spots around Amsterdam? Check out my article on the highlights of Amsterdam Noord. Plan your trip to Amsterdam using my extensive and complete Alternative guide to Amsterdam. 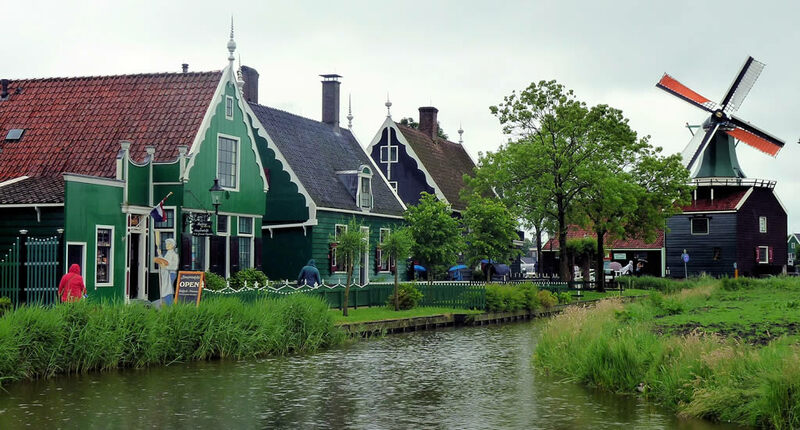 Check out 5 beautiful canal villages in The Netherlands. 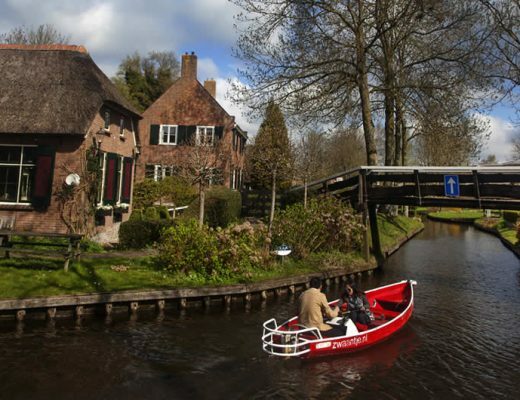 Did you know Edam is only a 20-minute bus ride from Amsterdam? 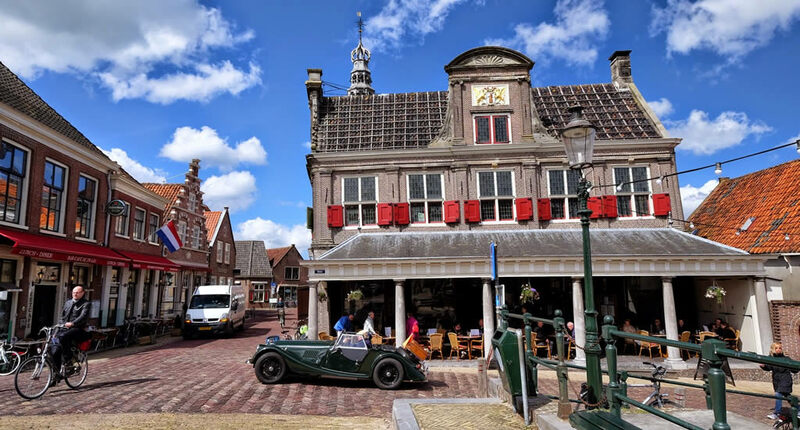 Read all about Edam and go for an afternoon visit. Really love this! I’ve not been to Marken, but really want to visit. A lot of people don’t realize how close Amsterdam is to so many cute villages! Ah, these villages are a photographer’s dream come true! Absolutely adorable! 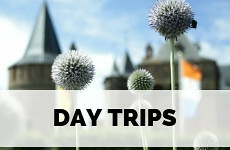 Your blog is such an inexhaustible source of information for great places to visit in the Netherlands. I’ll definitely add these to my list of places to visit. 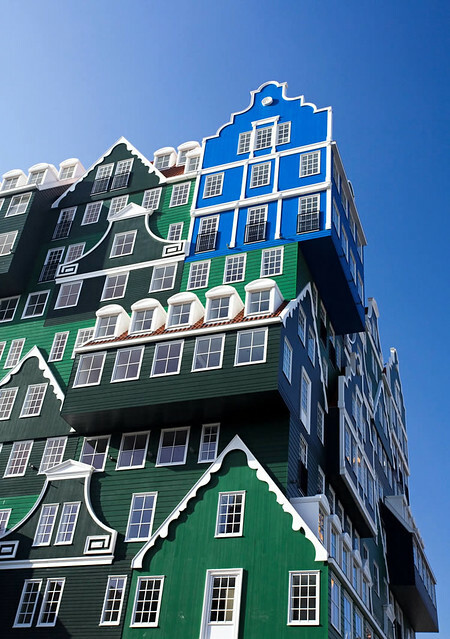 I love the way the Inntel Hotel Amsterdam Zaandam looks like individual houses stacked on one another. Zaanse Schans is a town I’d like to visit. The effect of bringing in historic buildings and the working windmills showing how industry used to be is fascinating. Monnickendam looks like a village I would like to stay in overnight. I love this! Those towns all look like postcards! Would love to visit there someday! This is fantastic! 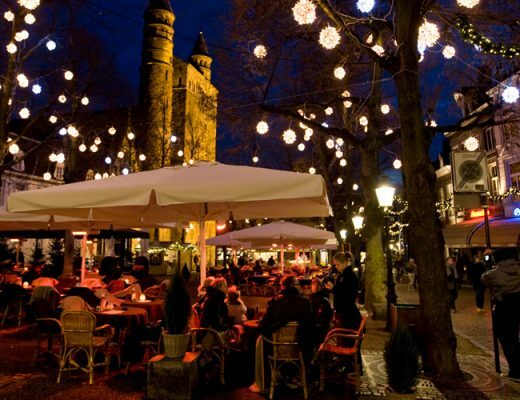 We hear and read so much about Amsterdam; it’s nice to read about these close-by areas. The fact that they are so easily accessible is great, and makes it even more of a mystery that you don’t often read about them. 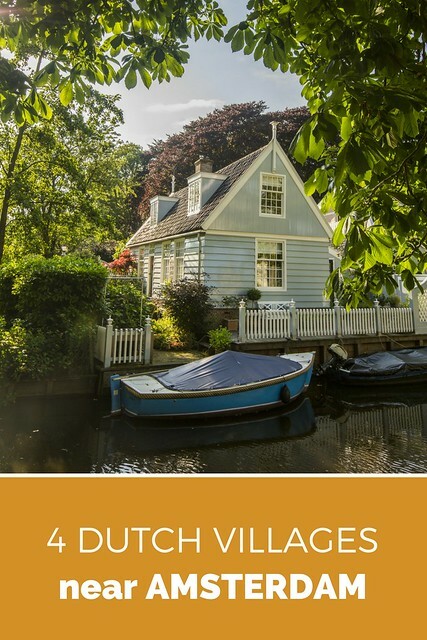 Zaanse Schans is right at the top of our Must See list, but every one of these villages seem idyllic! I loved my one and only visit to Amsterdam but it was entirely too short. I’d love to go back and also visit these villages. I find that I enjoy visiting cities but I really love to get outside of cities and catch glimpses of life in small towns or the countryside. Ah, in that case a trip to The Netherlands, in general, is a good idea, Jill. As you can basically see so much within 30 minutes from Amsterdam. You could even consider skipping the city altogether (yes, shock horror). We visited Zaanse Schans and loved it. It is a very romantic place, isn’t it? Haha, Zaanse Schans is not really my idea of romantic (I know better romantic spots in The Netherlands I guess), but yes, it is special. What wonders! Love the colors and architecture. Amazing too that some of the locals still wear traditional garb, even if only for holidays. The seaside pictures make me think of famous painters. Beautiful. 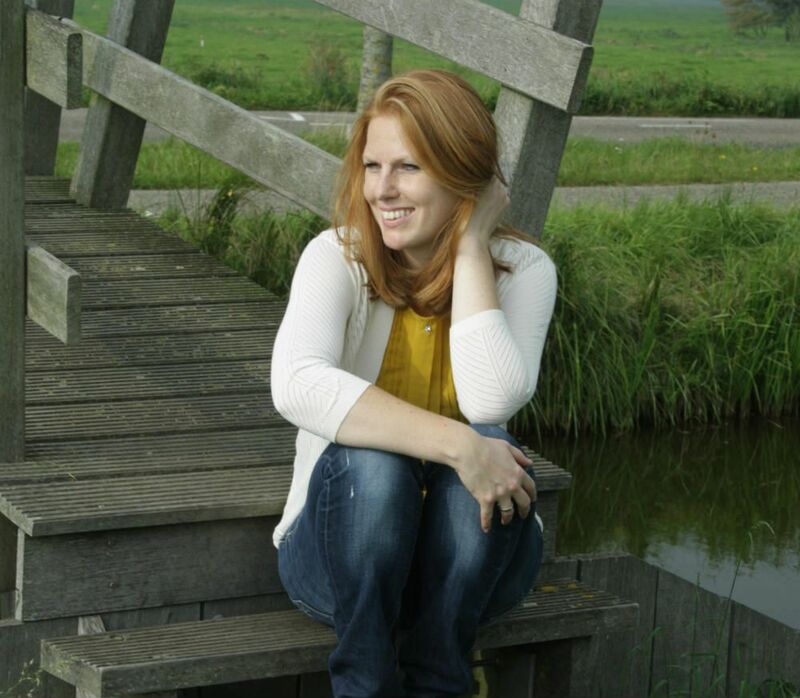 I’ve been to Zaanse Schans twice now and loved it! But the rest of these are just stupidpretty!!!! I love them so much and I have wanted to see that awesome mixed building! Don’t know the name! All of these villages look worthy of a visit. The one I like the best is Zaanse Schans. That green coloured windmill is calling my name. Thanks for linking up this week. Such gorgeous little spots in the Netherlands! We visited Monnickendam- such a lovely little fishing village. Beautiful photos. These villages look so quaint and adorable. Will put at least one of ’em in my must-see places when I visit The Netherlands. Your photos are lovely too. Amsterdam definitely seems like a good place to base yourself when in the Netherlands. I’ve known for a while I want to visit Zaanse Schans but the others are new to me. Marken especially catches my eye. 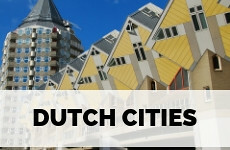 Great ideas for my next Dutch trip! Wow! Amazing villages! Love the windmills, such amazing scene. Also love the architecture and the colors of the buildings. Great work, thanks.